Last month saw the release of my most recent book, Doing Youth Participatory Action Research: Transforming Inquiry with Researchers, Educators, and Students. 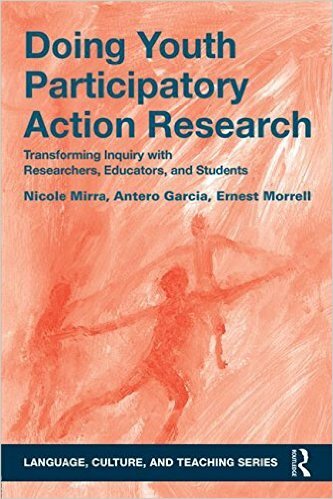 Co-authored by Nicole Mirra and Ernest Morrell, this is a book that details our work with the UCLA Council of Youth Research and the role of YPAR as a critical methodology. The book is published by Routledge as part of Sonia Nieto’s Language, Culture, and Teaching series. I’m extremely proud of the work that we’ve described in this volume and would be remiss to note that the narrative of the Council of Youth Research (like many YPAR projects) is one that includes dozens of teachers, students, and graduate students. We did our best to include many of these voices in the book. Earlier today, Nicole and I published a co-written blog entry for DMLcentral about YPAR and Connected Learning. I believe that this post captures the kinds of questions we are pushing through Doing Youth Participatory Action Research. I’m pasting the intro to our pose below and – if you want to see the ways we address the 5Ws (and “how”) of research, take a look at the whole thing here. Last month, the two of us (along with our mentor, Dr. Ernest Morrell) celebrated the release of our book, Doing Youth Participatory Action Research: Transforming Inquiry with Researchers, Educators, and Youth. The book tells the story of the UCLA Council of Youth Research (YPAR), a long-running youth participatory action research program that mentors young people from South and East Los Angeles to develop research questions about the educational and social challenges they recognize in their communities and then conduct rigorous inquiry into those questions for the purposes of fostering empowerment and action for social justice. We drew on our membership in the Council community to detail one year in the life of the program and use this portrait as a lens through which to explore YPAR as a radical vision of knowledge production that can transform how educational researchers approach their work — particularly those in the connected learning community. While the central activity of YPAR — providing young people with the support and resources needed to develop, conduct, and share research projects of their choosing — occurs across many settings (schools, after-school programs, public health initiatives, etc. ), YPAR is an umbrella acronym to describe a mode of scholarly inquiry that pushes back on traditional understandings of the key actors (youth), processes (participatory), and purposes (action) of research. As our DML community so often focuses on the role of participatory culture, collaborative design and research with youth and educators, and the possibilities of digital technologies within contexts of equity-driven education, we believe that the foundational work of YPAR points to design and research pathways for researchers of connected learning in both formal and informal learning contexts. YPAR is inspired by ideas about knowledge that have been reflected for decades in movements for social justice, from Paulo Freire’s work in Brazil to the Freedom Schools of the American Civil Rights Movement. As active participants in meaning making and theory building, youth and adults alike must consider how the work we do continues to work toward liberatory engagement in contemporary society. YPAR has much to teach us today as we consider what research means and what it is for in an ever more connected (and sadly, ever more divided) world. The remainder of this post explores the 5 “Ws” and “How” of contemporary research: if we are to take the work of youth and our work alongside them seriously, we must question the foundational premises of educational research in the 21st century. Posted by antero on Monday, December 21, 2015, at 11:07 pm. Filed under clips, education, literacy. Follow any responses to this post with its comments RSS feed. You can post a comment or trackback from your blog.